There is nothing quite like seeing a humpback whale launch itself out of the ocean a few metres away - and that's the experience you can have if you travel to Hervey Bay during whale season. Each year thousands of these gentle giants rest, play and nurture their young in the sheltered waters of Hervey Bay. The season runs from mid-July to early November and there are many whale watching vessels that head out daily and offer the chance to get up close and personal with these majestic creatures. Watching these guys still not quite close enough? Tick off a bucketlist moment when you experience swimming with these gentle marine mammals. With a range of accommodation from backpacker hostels to five-star resorts, Hervey Bay is a popular holiday destination particularly for those on their way to Fraser Island or Lady Elliot Island. The town is a great place for water activities like fishing, sailing, swimming and kayaking. 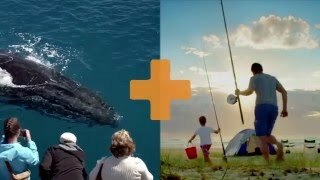 Take an eco-tour to see dolphins, turtles and other marine life - or go diving at Hervey Bay's sheltered artificial reef, the largest man made reef in the Southern Hemisphere.